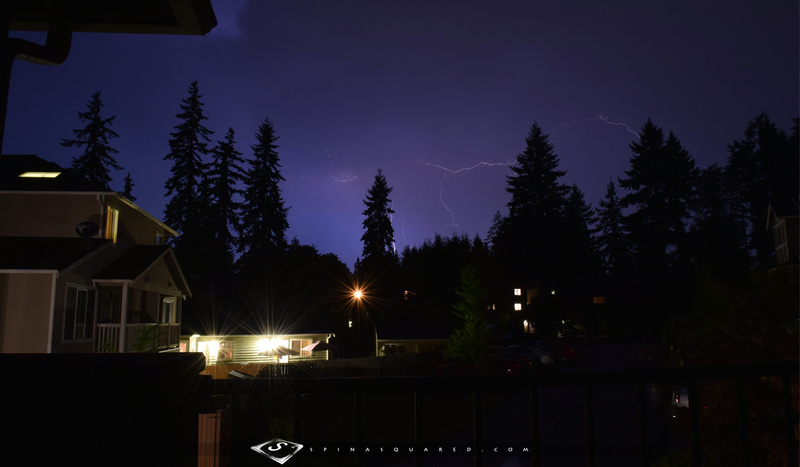 After a record setting 96-degree day in Seattle yesterday we were hit with a light show from above that was accompanied by explosive rounds of thunder as a lightning storm quickly moved North across the Puget Sound last night. We turned off all the lights, opened all the blinds, and sat in silence as we watched the night sky light up with each flash of lightning, counting the seconds until we could hear the thunder to determine how far away the storm was. As the storm continued to get closer and closer we thought about digging out the camera gear but hesitated for fear of missing out on the action. But when the storm moved in right over head and started dropping lightning bolts in our back yard we knew we should probably make an attempt. By the time we were set-up and ready to shoot the storm had moved past our house on it’s journey North but we were lucky enough to catch a few lightning bolts off in the distance. … Our first successful attempts at capturing lightning on camera!